It’s all about the bling for Annette Edmondson. Some people wear tinhats (I think we know their twitter handles!) 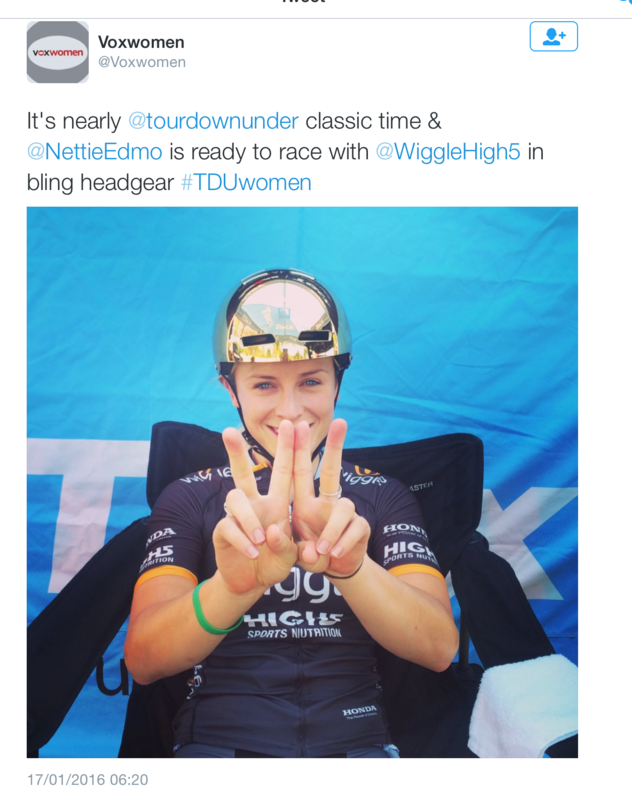 and some go for gold – and Nettie took stage 2 of this year’s women’s TDU. The colour of victory! 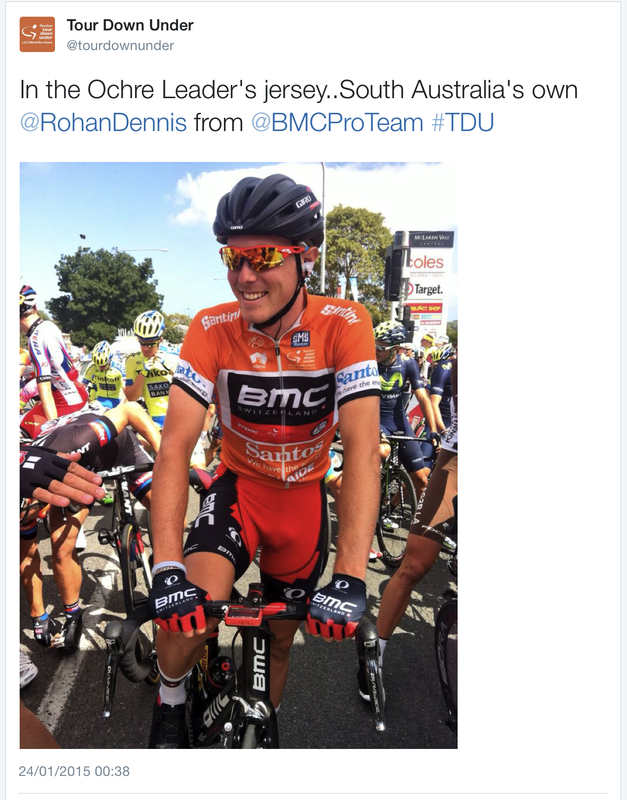 Last year’s champion Rohan Dennis showing off the leader’s jersey. This hour-long circuit around Adelaide is staged a few days before the start of the TDU – a final tweak for the legs to be in race condition. Today’s winner (for this is posted on Sunday) was Caleb Ewan, Orica-GreenEdge’s pocket rocket. That victory salute reminds me a lot of another Australian sprinter … Robbie McEwen. We all learned during last year’s grand tours that the shorter and punchier the stage, the more exciting the racing from the get-go. With no TDU stage over 160km, we’ll have punchier racing all week long. And speaking of Robbie McEwen, while we have Juan Antonio Flecha getting us behind the scenes scoops during the European season, Australians get the benefit of the wisdom according to Robbie. 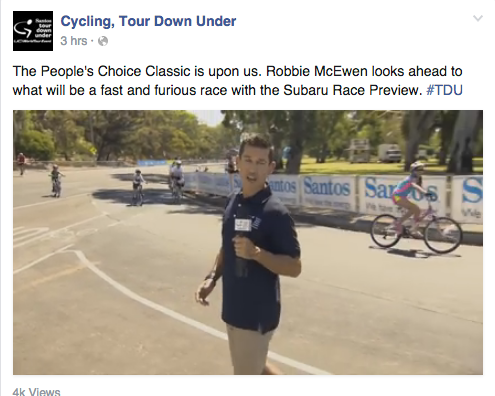 Check out Tour Down Under’s Facebook page, where they have Robbie’s polished and insightful preview clips. Let’s start a petition to get him working with JAF on Eurosport! Let’s face it, the TDU parcours isn’t what you would describe as mountainous. Described as ‘from flat to undulating’ (and let’s face it, undulating is a great word), the six stages usually end in a bunch sprint. Midge has informed me that the TDU Tour Tracker is, (and I quote) “the best one from last year for info and humour”. Excellent for those in the Northern Hemisphere of the Veloshire who want to catch up on the ‘info and humour’ that was going on while they slept. There used to be a tradition a few years ago of Australian fans picking a young, unknown rider for special treatment all week – someone who was a hardworking domestique and whose mother tongue was not English. Once the rider had been picked, fans would wait for him at his hotel, cheer him on during the races and bring him lots of homemade treats. I wonder if they still do that!?! It’s a great tradition! Australia is the nation that has won the most TDUs since it started in 1999 with 10. Germany – or more precisely, Andre Greipel – and Spain are the next winning-est with … two each. So there’s a lot of ground to make up for the other countries in the race. The last five editions has been won by Australia four times … only Tom Jelte-Slater from the Netherlands rained on that parade in 2013. The TDU Queen Stage has two laps of Willunga Hill, a 3km climb with an average gradient of 7.6%. It might not be the Stelvio, but it does give the riders a chance to break away, stay away, put down some pain. 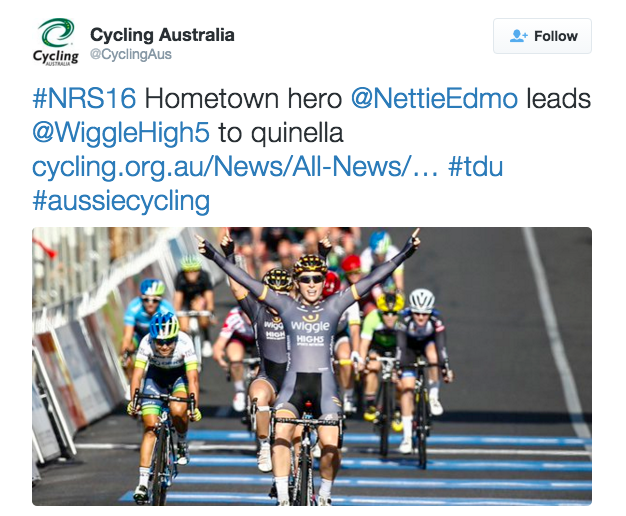 Last year’s winner was Rohan Dennis as he was the highest placed rider under the age of 23 (and he just happened to win the whole darn thing! ), a few years younger than these jerseys in the grand tours.